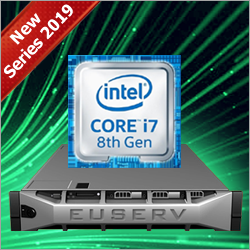 The dedicated root server series "Instant64" offers in the 5th generation at a great price / performance ratio a combination of fast Intel Core i7 processors, a lot of main memory (RAM) and fast SSDs or large hard disks in the Raid1 network (data mirroring). This server series uses a high-quality single-socket mainboard. All servers come with up to 20TB harddisk storage or 2TB fast SSD storage and a Gigabit connection is provided. The "Instant64 v5" server series was developed for private and professional users with high demands on speed and memory at a favorable price. All "Instant64 v5" servers are so-called "BTO" (Build-to-Order) servers. Overview dedicated Server Series "Instant64 v5"